Designed by LANGRIA for all travelers that are about to face a long-haul trip. This travel pillow uses 100% supportive memory foam filling and eyelet fabric cover, which is skin-friendly, breathable and machine washable. 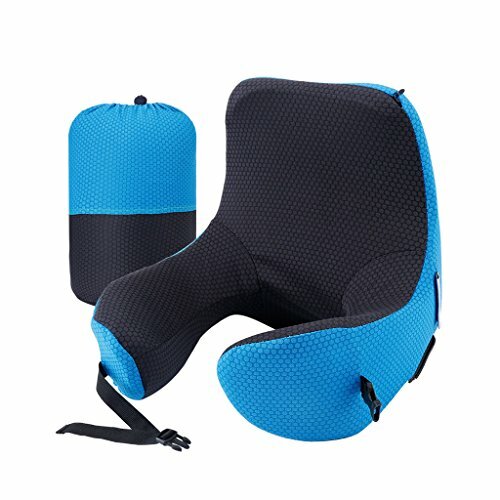 It has a unique shape with a hood to ensure a comfortable deep sleep experience and a strap to adjust the pillow to your neck size! - BASIC POSITION WITH A HOOD: when you need u-shape basic support and want to wear the hood to block the light from bothering you when sleeping. - UPSIDE-DOWN: turn the pillow upside-down to get extra support for the head, best when you want to lean against a hard surface like a wall or the headrest is not comfy enough. - SIDE POSITION: turn the pillow and lean against it. You will prevent your head from annoyingly knocking your head on the window when traveling by plane, car or bus. When dirty, unzip the eyelet cover and machine/hand wash them. Please do not wash the memory foam, it will deform and lose its properties. All dimensions are measured manually with a possible deviation of 1-2cm. Please wait for 24 hours for the pillow to fully expand and 1-2 weeks for the odor to dissipate.